Have you ever gotten to the 10th or 15th day of the month and wondered where all your income you just got went to? We’ve all been there. It’s the last day or last Friday of the month and it’s payday #woohoo! The bad news is by Sunday you’ve spent a good proportion of that money and by the following Sunday you’re stuck. You should have more money, but you don’t. And you still have bills to pay mid month. You also need to travel to go see your parents. Or maybe not? So what do you do? How do you make your money go further? 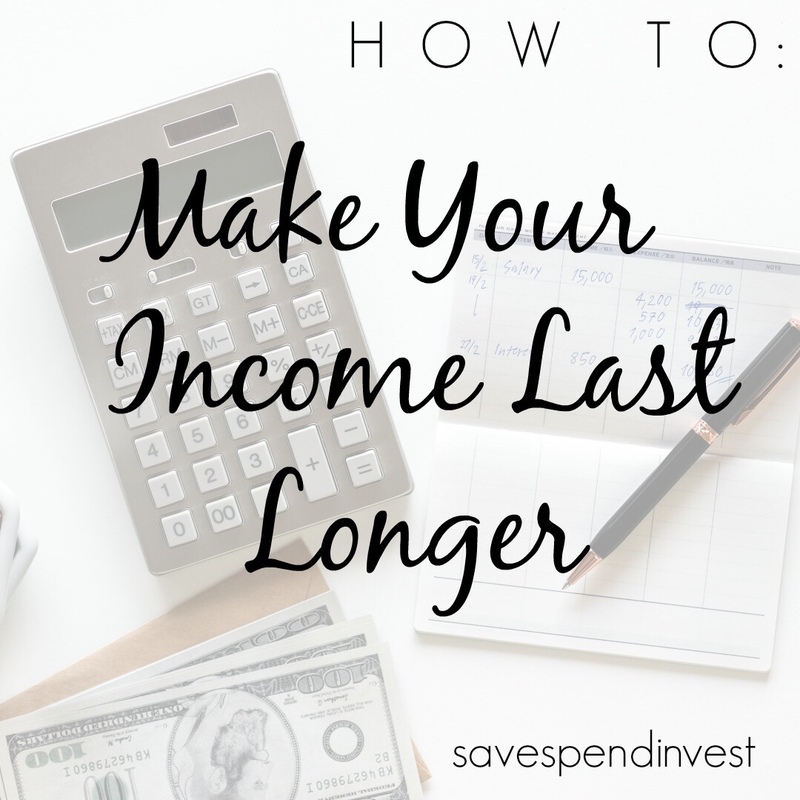 Here are two things you can try to make your income last longer. Choose what works for you and stick to it as far as you can. After planning ahead and knowing how much your fixed bills are (this includes rent/mortgage, utilities if fixed, car/home insurance etc), you take out that amount from the top (after you take out savings of course). I’d suggest, if it’s possible and this is the option you prefer, changing all your billing dates to two days after your paycheque comes in. Two because of bank timings and to be on the safe side. You can call your landlord or utilities provider to arrange this and it should be fine. So if your income comes in on the last day of the month, make all your bill dates the 2nd of every month. That way, you know exactly how much you have left for everyday revenue expenses by the 3rd day. In other words, you’re done paying for the important stuff and now you have the rest of your money to do as you like without worrying about huge payments slipping out of your account at midnight. But to really make that left over money go further it’s important to know what you’re spending and how you’re spending it. i.e. Budget. Don’t freak out, it’s not that much of a myth. It’s just apportioning what’s left of your money into your various life categories. So food, travel/transport and say social life. These are variable but if you can put a figure on how much you expect to spend on them roughly you’re on to a good start. Add a buffer of 10% for safety. And then work with those numbers as strict as possible. Sometimes we forget someone’s birthday dinner and we didn’t plan for it. That’s ok, as long as the apportionment still adds up for you and doesn’t leave you high and dry mid month it’s all ok. This option may be easier for people without steady incomes or if you have income coming in from different jobs at different times in a month. Like the above you might have to change one or two billing dates. I’d say probably space them out within a week of each other. So let’s start with rent/mortgage payments coming out on the 1st, then tax/insurance on the 7th, utilities on the 14th and mobile phone bills/gym/other miscellaneous on the 21st. This way you roughly can match your income coming in to your expenses across all the four weeks in a month. That way never at one point are you left with no cash or left with a “how am I going to pay the rest of my bills now?” It’s all about strategically planning your finances around those dates. Here’s a financial calendar I’ve created so you can see what I’m talking about visually. Check it out here.